The most notorious expense ever! Sugar!! Johnny must have got a heavy bashing after this, I guess! That’s the part, the poem doesn’t speak about, but it can be pretty much pried up!! Use of sugar is prevalent since ancient times. It is the taste component that turns eating into a desirable and delectable experience. Tea, coffee, cakes, pastries, sweetmeats, ice creams, sodas, energy drinks, candies, yogurt, and this list is a lengthy one, if we are to name all the sweet dishes. Confectionaries get unique from country to country. The type of sweet products you get in Europe will differ from those found in Asia! And the cookies you get in our country is pretty different and can’t be found anywhere else in the world! Plus, we each have our own distinct preferences for sweet products, and we all love to experiment with this substance from time to time. Even I spent nights on munchies, shuffling through kitchen shelves and lighting up the stove to make gelatin cakes, milk savories, et al! Time had no bar, it could be anywhere from 12 am to 3 am!!! But I have stopped doing such activities, as I understood whatever I was doing, was bad. It was like an addiction! Every single night I used to get the craving for something sweet! And till I was satiated, I couldn’t sleep! It was then, that I started to look at sugar from a different angle. I came to know that this white powder was a substance, that involves dependency and tolerance just like any other powerful drug! This post is written to address a very important situation! A situation that’s probably killing us slowly, but no one seems to know or be attentive about it. 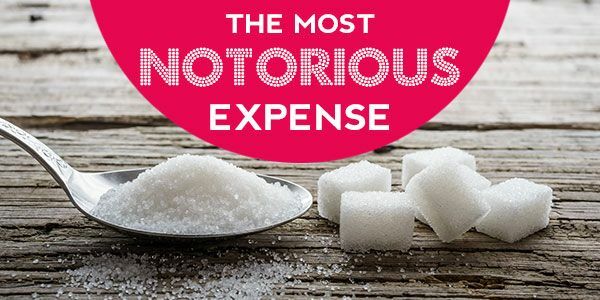 We at Debt Consolidation Care, have been doing research on household debt for the past couple of months, and to our surprise, we figured out, Sugar is the most notorious and dangerous expense ever! This product is a drug! Big time drug! It causes changes in hormonal secretion, triggers neurotransmitter levels, and gives you a happy high feeling! All families are using this compound with no restriction in its consumption, giving it to children, mixing it with foods and drinks, and so and so! But, guess what! The results for the sugar abuse are very costly. It leads to Obesity, Depression, Diabetes, High Blood pressure, kills libido, even can cause wrong evolution - which is cancer, and most of all, it welcomes Debt to your own house, unknowingly! We would love to see your active participation on this topic, by commenting down below, or starting a discussion in our forum regarding any queries you have! Just sign in and click on “Post Your Questions” to initiate a conversation with other members of DebtCC.com! Does Sugar increase your chances of getting Diabetic and Obese? Does Sugar help in mood elevation, thereby causing depression during the fall? Does Sugar increase your overall grocery cost and binge food consumption? Is sugar a big factor behind the majority of people having Medical Debt? Let’s reveal the devils of such an innocent looking sweet chemical!! Diabetic conditions start to manifest on your body when the relationship between insulin and blood glucose gets hindered. Either your body won’t produce insulin, or your body might not respond well to the insulin. In either of the cases, your blood sugar increases, and you become a victim of Diabetes. Excess starch and sugar intake force our body to convert glucose into glycogen and store it as fat, for future use! That’s how the body functions. And, excess body fat leads you to obesity. On the other hand, Sugar has a huge tendency to turn you into a Type -2 Diabetic, which you start to realize when it’s too late. Our body responds to different foods in different ways. The way it treats carbohydrates is different than the way it treats fats and proteins. When you increase your daily consumption of carbohydrates, your body cannot process the saccharides (a type of carbohydrate), and will eventually increase the glucose in your blood. To cut it short, you need to cut sugar intake, if you really want to avoid diabetes and obesity. Sugar changes how our brain functions. It creates an imbalance in the production of Serotonin and Dopamine. The more you take sugar, the more will be the increased rush of these two neurotransmitters. Your nerves and brain will then start to rely on sugar for the production of Serotonin and Dopamine. Until and unless you get your fix of sugar, you won’t feel good and happy! Sugar is seen to have a direct link with mood elevation, which keeps you wanting for more! And, once the effect of sugar starts to wear off, exactly the same as any other drug, you start to feel the withdrawal symptoms. Cases of insomnia, increased body temperature, decreased appetite, anxiety and depression, upon the cessation of sugar use, are pretty commonly observed. That’s exactly what signifies Sugar Addiction. In easy words, you need sugar more than food. You have started to depend on it. There are many people who love to take a sugary bite after every meal. It’s more like a habit that gives the eater a sense of feeling, that the meal is incomplete without some sweet dish. Sugar addiction is most dominantly portrayed by children and old adults. Many mental disorders have a strong relation with sugar, like Bipolar disorder, Alzheimer’s, and obviously depression. So, next time you order or cook anything sugary, try to eat it in minimal quantity. Sugar is available in abundance, in carbohydrates. We have monosaccharides and disaccharides. Glucose is mono-, whereas, the table sugar is di-. But whatever it is, they are easily obtained nearly from any food source, rich in carbs. Examples of such food are Potatoes, Cookies, Breads, Rice, and even Corns. Well, it’s still unnecessary though to completely cut out Carbohydrates from our diet. The old saying is true, that little of anything is good. But, the issue is not even with Carbs here. The problem is people start to exhibit psychotic behavior, like binge eating and impulsive spending for anything that tastes sweet, or fast foods! Binge Eating is dangerous! It means consuming a heavy amount of junk food in a short time, thereby causing overeating in a much more broader sense. Say for example a person is hungry! What he does is, he consumes an excessive amount of sugary foods along with a high carb diet, say 3 burgers and a bottle of Coke. That’s where he blew up the house! His blood sugar will shoot up in few minutes time, trigger serotonin and dopamine, and give him a happy feeling. But it will soon fade away, and the person will again start to crave for more food! This way he builds up enough fat in his body, that will not make him truly hungry for a couple of days. Then once the body again looks for food, he will repeat his binge eating behavior. The cycle goes on like this till other disorders start to set in. An example is Bulimia, where a person after a session of excessive eating, throws up whatever he ate, out of anxiety and fear related to the physical appearance of the person. Elton John suffered from bulimia, for your information! Though his was mainly triggered by illicit drug abuse! Here too, the issue is much deeper. Many Americans are complaining about the high uncontrollable insurgence in their grocery cost! Why is it so? Sugar plays the hidden role here again! Daily basic foods like veggies, meats, and fruits don’t cost much. The costly bargains are cookies, varieties of breads, biscuits, cakes, sodas, alcohol, chocolates, ice-creams, and you can name anything that has the sweet taste to it! With our ignorance, we have welcomed a drug to our household, that just don’t seem to go away anytime soon, unless we become aware of the facts, and tag sugar as dangerous, just as we have done to other illicit substances!!! We all pretty well know that medical cost in our country is a drastic high in the whole world. Diabetes, Obesity, Blood Pressure, and Cancer are all very costly and life-changing illnesses. They require long term treatment with medicines that are expensive! They also demand regular visits to the doctor. In the middle of it all, Medical Debt snarls in most of the households! This debt, in particular, is different than other consumer and unsecured debts. Because medical debt amounts are typically high, we ask consumers to settle their debts, so that they can get than other conrid of some hassle. You should do further reading on debt settlement to know how it works! To summarize the real cost of Sugar, let me remind you again of what it does. It increases your grocery cost, instigates impulsive spending behavior, and most importantly destroys your health and makes you kneel before huge medical debts. The game is however played by you. It’s up to you, whether or not you want to eradicate sugar completely from your life, or indulge in it completely avoiding all its ill effects, or become smart and manipulate sugar by consuming it in sensible quantities. Sugar is not bad! It supports instant energy boost! But too much of energy can also cause heat burns and flashes! We wish you a happy, healthy and debt free life ahead!